Have you been invited to an Indian wedding recently? Perhaps it is a colleague or a friend who is getting married. You might be perplexed as to how to go about it if you haven’t been to an Indian wedding before. 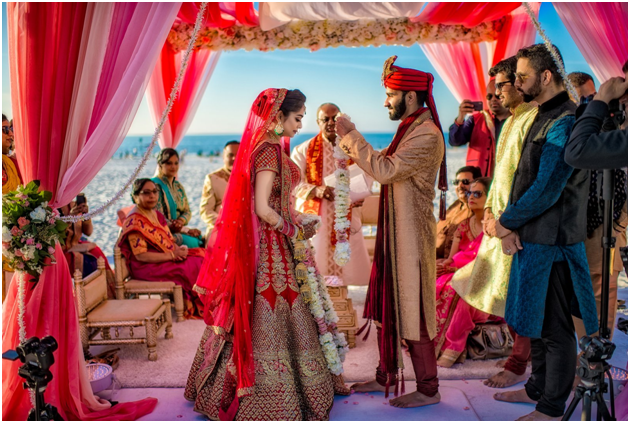 Indian weddings are full of culture and tradition, and as a guest, you should acquaint yourself with them. Here are the top 5 things you need to know before you attend an Indian wedding in the US. Attending an Indian wedding can be a thoroughly enjoyable experience. You can expect a lot of rituals, ceremonies, and myriad of food. It is very unique and each ceremony is celebrated with a lot of enthusiasm. You can familiarize yourself with the diverse ceremonies to participate in a better way. While you become a part of this celebration, it is important to dress the right way. Indians value culture and women will usually wear saris, salwar suits, or lehengas. Men wear ethnic clothes like sherwani or a kurta set. To blend in with the guests, you can also dress up in Indian ethnic wear. There are a lot of options in beautiful array colors that you can choose from. If you don’t belong to India, it would certainly be an exciting experience adorning the Indian ethnic apparel. If you wish to wear western clothes, it is fine as long as you don’t wear anything too revealing. Keep it simple and colorful. Try to avoid black colored outfits as they are not considered to be suitable for ceremonies like weddings. Just like the wedding wear, the right jewelry plays a very important role in Indian weddings. Women usually wear gorgeous and chunky jewelry that can be multicolor or simply have a neutral hue. You can accessorize with something that matches your personal style. Necklaces, bindi, bracelets, earrings, and hair accessories are always in vogue. Finding Indian jewelry in the US has become really easy. It has everything from bangles and earrings to beautiful rings. You can explore their collection to find something that goes with your outfit. An Indian wedding is truly incomplete without appropriate jewelry. Moreover, it is a crucial part of women’s attire. Guests usually wear jewelry made of gold, diamond, and silver while attending an Indian wedding. The bride herself wears accessories like nose rings, bangles, maangtika, necklace, and the like. If you wish to become a part of the celebration, buying jewelry is a must. Wearing certain pieces of jewelry has logic according to the Indian tradition. The fashion with regards to jewelry has changed a lot over the years. You can find a lot of varieties to choose from. You can either opt for a completely traditional look or give it a modern twist with the right accessories. Since Indian culture is different from the western one, you must keep certain things in mind while attending an Indian wedding. Not knowing the wedding etiquette can unintentionally offend others. For instance, during certain wedding rituals, the guests are required to remove their footwear before entering the sanctified area. If you are not sure about what do to, it is always best to ask the people around. In Indian weddings, guests will not generally kiss the bride or try to dance with her. You might embarrass yourself if you attempt to do so as it is not common in the Indian culture. It is best to respect the Indian traditions even if the family is of liberated beliefs. In certain cultures like the Sikh weddings, women are required to wear a dupatta or stole above the head while the ceremony is going on. For women, if the outfit does not come with a stole, you can carry an extra one so that you can abide by the rituals. It is always best to dress according to the prescribed dress code. Men can carry a handkerchief with them that can be placed over the head during the ceremony. Remember that the do(s) and don’t(s) vary depending on whether it is a Hindu, Muslim, or a Sikh wedding. Don’t expect Indian weddings to be only during the day. Based on the religion of the couple, it can be during the night, late evening or even early morning. Go through the invites properly to know what to expect. You might have to stay up all night for certain ceremonies or get up super early. Find out about the timings and then get enough sleep beforehand so you can enjoy the wedding in full spirit. The best gift to give is considered to be money which will help the couple in starting a new life together. You may keep the money in an envelope and present it to the couple while wishing them on their big day. It is considered auspicious to gift amount that ends with the number 1. For instance, offering 21, 51, 101 and the like, irrespective of the currency. The money you give completely depends on how much you are willing to spend and how close you are to the couple. If you must show up with a gift, then give something that will be useful for the couple in starting a new life together. So, you are all set to go with the above tips while attending an Indian wedding. Everyone respects their religious beliefs and it is important to be mindful of their sentiments when attending a wedding. Make sure that you dress right and wear the right jewelry. You can buy enchanting jewelry from available online & offline. It has a beautiful collection of ethnic Indian jewelry which would look perfect for an Indian wedding.